If you're in the New York area, you should head over to Shop Art Gallery this Saturday (October 3rd, from 6PM - 9PM) to catch the opening reception of Visual Vernacular. My talented friend, Iviva Olenick, will have over twenty of her beautiful pieces exhibited in this group show. I can't wait to see more of her, Were I So Besotted series! Each of her hand-embroidered works are heartbreakingly lovely. Make sure to come out and see the show! So, the BIG SALE has officially run its course. Thank you to everyone who purchased something or helped promote the sale. It truly means a lot to me. (Shipping will commence on Friday after I sort through and pack everything up.) I still have boxes and boxes of things that need to go to good homes, so I'll continue to post to the BigCartel shop and update the blog periodically with new things up for grabs, but probably won't be updating the shop with as much fervor as I did while the BIG SALE was in progress. Do visit the shop and send me emails with any requests. You never know if I'll have it laying around... and THANK YOU AGAIN for all the support! I would write more. I would write more to share the last couple of days, but I am supremely jet lagged. Someone once told me that being jet lagged was from your soul having not caught back up with you. I don't know if it's "true" or not, but it certainly feels that way. A day has disappeared somewhere in between and I find myself back here in the City that never sleeps, being tired and sleepy. My travel plans for the show in Hawaii got moved up a day. (Please come out and visit if you're in the area!) This is most excellent news since I'll get to spend an extra day in paradise. The only downside is that everything that I had to do tomorrow must be completed in the few hours I have now before I leave. Sadly, this means that I won't be able to take pictures and upload everything to the laptop for the BIG SALE before I head out. But, as a way to clear out space in the shop to make room for more goodies when I return and to celebrate my birthday, I'm offering a 15% promotional discount on all sales from now until I return on September 29th! Just type in the code, "BIRTHDAYBOY" in the promotional code section at the time of check out to receive your discount. So far it's been very busy, but it'll get even busier with company coming and all the shows I've just been signed up to do. I'll be at the Long Island Bead Festival, Big Apple Glass Art & Bead Festival, Twin Cities Bead Bazaar, and at the Pittsburgh Bead Mercantile show – and that's all just in October! Don't forget the Soft Flex Hawaii show this weekend! I've added a new section on my BIG SALE devoted to Candice Wakumoto and her lovely cast components in sterling silver and bronze. I can't say how much I love Candice's work; I was hooked at first glance! CLICK HERE to see the new section and lay claim to these hard to find goodies! For all orders received to my BIG SALE, I'll be sending a 4" X 4" mini collage. They are apart of the Migration series. Each one of them has layers of paint, sewing, woven paper, and collage. They are all unique and will remain a surprise until they are sent out. (I'll be sending out only one per customer.) It's my way to say THANK YOU and to embrace this time of transition and catharsis. So, check out the BIG SALE and see if you like anything. 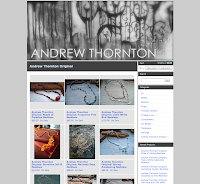 Since I've been receiving requests since the launch of the shop, I updated the BIG SALE with eleven Andrew Thornton Original finished jewelry designs. These are some of the most popular (and in some cases, award-winning) designs that I've made up for grabs. CLICK HERE to go to the Originals page. 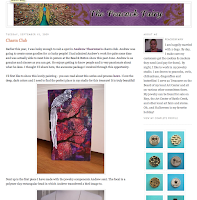 For my Kandinsky inspired necklace I made for the Art Bead Scene's September challenge, I was selected as a Featured Designer of the Week! CLICK HERE to check out the ABS post and HERE to view my necklace. If you're in Brooklyn, you should check out the site-specific piece, Surfacing Beneath, by Lisa Kellner. The opening is on Saturday at the BAC Gallery. I met Lisa several years ago at a summer residency program at SVA. I regret not getting to know her better then, because I love her work. The sensuous lines, organic forms, visceral fluidity and seemingly biological landscapes are breath-taking and well worth a trip out during the D.U.M.B.O. Art under the Bridge Festival. CLICK HERE for more information about the exhibit and HERE for more information about Lisa and her work. 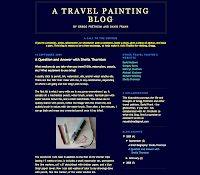 My sister Sheila recently did an interview with, A Travel Painting Blog. The blog, which focuses on art on the go, is maintained by Gregg Fretheim and David Frank. CLICK HERE to check out the interview and see the various travel kits she carries on her trips. I received an email this weekend, asking me why I collected vintage Avon bottles. Not only do I love the fun designs and interesting shapes the bottles come in, but they bring back a lot of memories. When I was growing up, my family didn't have a lot of money. My parents worked hard to take care of all of us and there was little extra left over for luxuries. Thusly, the perfume bottles my mom collected were rarities. Some were gifts and some were gifts to herself. She had come from the Philippines with all kinds of dreams and ideas of what life would be like in America. I imagine that these perfume bottles were tokens of that dream, of what life was supposed to be like. When I ask her about them now, she says, "Oh, I forget." Or she just smiles. As children, we were expressly forbidden to play with them. Regardless, I was going to play with them anyway. I thought I was so clever and no one was going to stop me. So, I waited until my mom laid down to rest and stuck bubblegum in the bells on the doors so they wouldn't ring. (My mom had put bells on the doors so that she knew where we all were in the house.) I got so carried away with my playing that I didn't hear my mom come up. The exact second I saw her, the bottle slipped from my fingers and the contents of the bottle began to spill out all over the brown shag carpet. We were both frozen in that instant and I can almost still hear the sloshy chugging noise the bottle made as the perfume gushed out. Instead of spanking me automatically, she uncharacteristically burst into tears. The details of how I was punished that day are all foggy now, but the real punishment that came every day after that are fresh in my mind. The perfume had soaked into the carpet and formed an indelible stain, a stain that when walked past would re-awaken and waft up memories of my transgression. When the incident happened, I was probably too young to fully understand it. But later, when I comprehended the struggles my parents went through, the new knowledge developed into a kernel of guilt. In adulthood, that guilt turned into a motivator. Instead of feeling bad about them working hard, I took pride that their lives were built honestly and through devotion to their family. Over the years, I've picked up dozens of these bottles, little reminders not of the incident and shame, but as small tokens of my own dreams and my own hard work. And... I like their fun designs and interesting shapes! 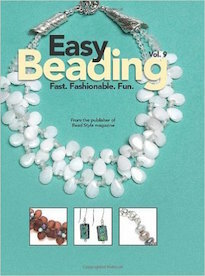 Bead-wiring vs. bead-weaving... which do you prefer? Barbe goes crazy over the new Mixed Metals book. Carmi creates a necklace using canvas and leather. Cindy makes more Through the Looking Glass Nugget Charms that match perfectly with Frost Links. 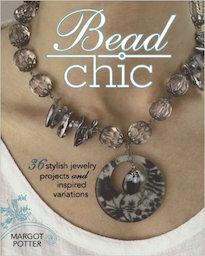 Bead cones can be used in more ways than one, and Lorelei shows an example of how! Andrew announces his BIG SALE! Check out all the goodies! The process of listing the goodies for my Big Sale has been very revealing. One of the things that I discovered, or rather, reaffirmed, is that I'm not a linear type of fellow. While some people make the natural connections, A, B, C, D.... my thought patterns are more like: A, D, B, C, Q. Some people have a natural talent for moving in straight lines. I'm not one of them. I think this is both good and bad. I have the lucky gift of finding unusual things in unusual places, but I don't have the mental fortitude to post more than ten at a time. I reach the ten mark and my eyes start to cross and I start to scroll down to other listings and start posting out of order. There are still HUNDREDS of items that still need to be listed, including more vintage Avon, lots of milk glass tableware, finished jewelry (both pieces I've made and a lot that are just in my collection), and those lovely fabic-covered handmade books that I have in stacks. So do be sure to check back often! I'll drink a Red Bull and eat a PowerBar and get back to work! In the meantime, enjoy what I have posted in the BIG SALE. 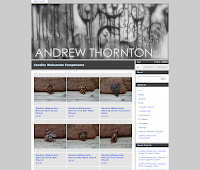 "Andrew's BIG SALE" is now online! Oh boy! It has been quite an experience so far! I'm not as technically savvy as I like to put on. Most of my information is woefully out-of-date or for programs that I don't have at my disposal anymore. So, I've had to crash course basic HTML and batch editing. I was editing each photo as though I would edit it for my blog, carefully rotating, resizing, and correcting anything that needed to be fixed. It was, needless to say, driving me slowly but surely insane. My wrist and eyes were hurting. Luckily, I've figured out how to batch edit the photos which has saved SO MUCH time! I'll be able to add things much quicker and thusly prevent the rapid mental deterioration that was aggressively setting in. CLICK HERE to visit the shop and see all the goodies I've added. I'll be adding more of them throughout the two week period randomly and continually, so there will constantly be new things to see! I was asked if I was "impartial and fair" about fifty-six times during my time at jury duty. I'd like to think that I am. It would be ideal if I was. Every time someone asked if I was, I'd reluctantly say, "I suppose so." The nasty truth is... I'm not. I'm too rooted in my experiences, in my life and memories, and I have too many emotional connections to really be truly impartial and fair. I have favorites. I have strong dislikes. Conceptually I can separate myself, but at the very core of it, I still get my gut reactions and trust my intuition that's been cultivated by experience. I guess that's why it's been difficult to muck out my proverbial stables and have a clean house. When I pick up an empty cardboard box, my mind doesn't say, "I don't need this. To the recycling bin you go." It instead says, "You need this. Cardboard boxes are useful. You could use this when you move, send something, or if you need a disposable surface when you're working on a messy project. Remember when you were a kid and didn't have a lot of money and had to transform cardboard boxes into treasure chests and cardboard castles? Remember that one time when you needed a box that was this size and you didn't have it because you threw it away? Keep the box for a rainy day." When I'm doing a major overhaul, like I am in the midst of now, this kind of thinking gets kind of dangerous. It certainly prolongs the experience and makes it a most dreaded task. At least I'm trying. Andrew's BIG SALE, as I'm calling it, will go live this afternoon at 2:00PM EST. The name isn't as profound as a "Soul Clearing Sale" but in truth, that's exactly what it is. You won't just be getting a ring or an old Avon bottle, you'll be getting a piece of me, my heart, my history, and everything that goes into what makes me just shy of being impartial and fair. I've been laying low the past couple of days trying to get everything ready for the BIG SALE! I always forget how much work goes into these online sales. Taking pictures, retaking pictures, editing pictures, uploading, taking measurements, writing descriptions, posting... for HUNDREDS of pieces... it's quite engulfing. The plan was to launch the BIG SALE tomorrow, but I forgot that I have jury duty. I pray that I don't get selected, because that'd throw an even bigger monkey wrench in everything. It has already displaced the BIG SALE and therefore made it conflict with my birthday get together. I'll have to temporary cancel it and try to reschedule for when I get back from Hawaii. I can't have folks come over in the midst of such chaos... the apartment looks like an antique shop and a bead shop exploded and covered every horizontal surface. I'm determined to have at least a few more get togethers in New York though. In other news, Heather Trudeau (aka The Peacock Fairy) just posted on her blog about the Charm Club I hosted earlier this year. She even included pictures of pieces that she's working on that include some of the things I sent along. CLICK HERE to check it out. Honestly, I was hesitant about doing another Charm Club. Life threw a lot of curve balls the last go around, and although it was rewarding to have a set goal of making things... it was also incredibly frustrating trying to make EVERYTHING balance out and still make good work. 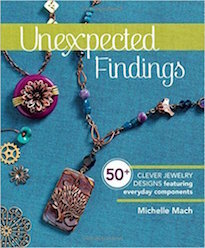 No one could have foreseen all of the obstacles that popped up unexpectedly. (Thankfully the participants were as patient as saints.) HOWEVER, after seeing what Heather's done with her pieces, I think I might give it another try. It's just a question of timing. One hurdle at a time. Right now the goal is to launch the BIG SALE this Thursday. I'll be adding things daily or as space allows. The sale will run for two weeks. (Yep, I've got that much stuff!) I'll be posting even while I'm gone at the Soft Flex Company Glass Art & Bead Festival - Honolulu, HI. Shipping will begin AFTER I return. The prompt for this month's Art Bead Scene challenge is Wassily Kandinsky's Improvisation No. 23. Kandinsky, like Arthur Dove, Georgia O'Keeffe, and other early abstractionists, was a huge influence on my work. The idea of trying to capture the spirit – the essence of something and give it visual form and have an effect on the viewer was a profound concept for me. Kandinsky's seminal work, Concerning the Spiritual in Art was a real defining piece of literature in the development of my work and my approach to making art. So, I couldn't miss an opportunity to show my appreciation for Kandinsky and contribute a piece. 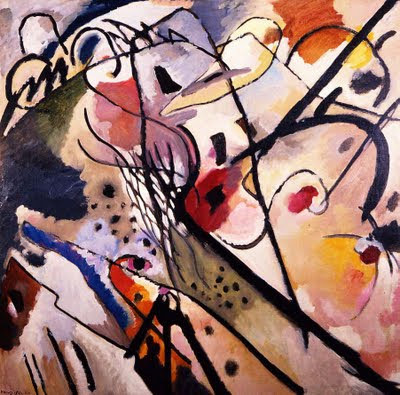 Above is an image of Wassily Kandinsky's Improvisation No. 23 from the collection of Munson-Williams-Proctor Arts Institute, Museum of Art, Utica. Since I've been pressed for time, I had to devise a project that was quick, but still held a lot of visual impact. I decided to create a chain out of shrink film and natural brass links. The multi-stranded piece also incorporates Keith O'Connor's ceramic rounds. It's clasped together with a shibuichi toggle from my family at Green Girl Studios. Above are some close-up shots of the shrink film links in action. I really like the way that they look when held up into the light, allowing the shadows to add another dimension and addition movement. Design ideas wanted!! If you have an extra minute, please stop by to see if you can help Lisa out with a suggestion for her co-worker's designer Italian pendant. Cindy' obsession with bronze metal clay continues. She shows off her new Art Nouveau floral charms. 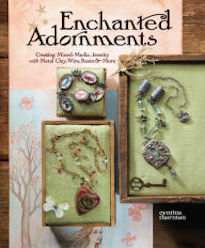 Melanie shares a sparkly crystal and brass pendant that she unearthed while cleaning her studio. 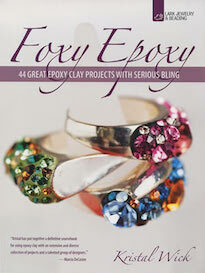 Jean reviews the new Crystallized Swarovski Elements #5328 bicone. Cyndi has finished another CopprClay necklace and wants to share the instructions! Lorelei is having fun using lots of Lynn Davis components in her design this week! Jean comes across her "Digg it" necklace – far out! She's like an archaeologist! Today has been particularly rainy and over-cast. It's as if the grey skies remember – remember and weep. I won't go into a long tribute or diatribe about September 11th. There's already enough of that if you care to read it. All I'll say is that I remember too. "In my own hands I hold a bowl of tea; I see all of nature represented in its green color. Closing my eyes I find green mountains and pure water within my own heart. Silently sitting alone and drinking tea, I feel these become a part of me." When I woke up this morning, I felt absolutely gutted. The day hadn't even started yet. I just looked around and felt completely drained. I think this happens in the midst of a big purging. 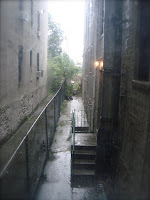 Everything seems to be at its worst – splayed open, crudely tossed into piles and hopelessly without a home. The end point is just far enough that the light can't be seen at the end of the tunnel. To add fuel to the fire, all the little things that need to get done start to come into painful focus: bills, laundry, dishes, deadlines, and most obviously... the strangling mess towering all around! On these such days, my beloved coffee is just not enough. It's too harsh, too quick, and far too routine for me. What I needed was my secret weapon! What I needed was a cup of matcha green tea! With all the little things that need to be done, it might seem counterproductive for me to take time out for enjoying this emerald treat, but in reality – taking time for the things we love is important. It's perhaps the most important thing. Preparing the matcha was a reminder of this. Measure, sift, whisk, and indulge. It was like opening a window to a stuffy room. The five minutes it took to prepare the bowl of tea and the ten minutes or so to really savor each sip resulted in hours of productive, efficient work. With each nutty, creamy sip, it was almost as though I was drinking down a walk in the woods with light filtering through a canopy of green. I felt energized, awake, and aware. The kit from Matcha Source was all I needed. It includes a traditional bamboo spoon, a fine metal sifter, a tea bowl, a delicate bamboo whisk, and of course the beautiful matcha green tea. Matcha Source has a full range of utensils, bowls, and of course matcha! Their website contains helpful hints, health benefits, and inspiring recipes that I'm dying to try. It is my secret weapon to fight off the daily doldrums, get work done, and feel creative! When coffee doesn't cut it, I turn to an age old tradition as rich and rewarding as the tea is tasty! After I finished my mini-vacation from the harsh realities piling up around me, I easily breezed through my tasks. Unlike coffee or other quick-fix pick-me-ups, matcha green tea is a balanced beverage loaded with antioxidants, amino acids, fiber, and chlorophyll. It has the same caffeinated verve as coffee, but without the jitters and shakes most people complain about. I crossed so much off my list, that I had time to whip up a bracelet. I had time enough to create – another important essential for me. I was inspired so much by the rich, earthy color of the matcha green tea powder, that I couldn't help but make my Ode to Matcha Tea. The Ode to Matcha Green Tea bracelet is made up of coin and potato-shaped pearls from Talisman Associates Inc., serpentine and gaspeite from Bead Trust, ceramic rounds from Keith O'Connor, daisy-stamped silver from Na Bo Row, and a shibuichi toggle and fine pewter leaf link from my family at Green Girl Studios. I think the quote on the back of the link honors the message of matcha green tea perfectly: Love life. Believe it or not, I was once a wizard. I carried a mighty staff, wore an enchanted amulet around my neck and collected rare seed pods with mysterious powers. The seed pods would render the bearer invincible and impervious to monster attacks. This provided to be most helpful when it came to facing evil-doing creatures in battle! 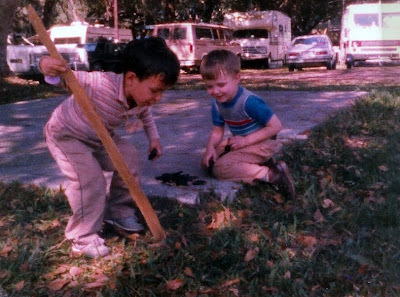 Above is a photo of my cousin James and I playing outside my grandparents' RV. Judging from the long-sleeves and taking in account the Florida heat and humidity, it must have been either Thanksgiving or Christmas. "Shirtsleeve weather" as they call it down South. The Cousins rarely saw each other, except for major holidays, so it must have been one of the two big ones. Earlier today, I was about to throw out a box, when a nagging feeling told me to search it again. At the very bottom, tucked under the flap was one of the seed pods. No, it wasn't one of the seed pods from this photo, it was a different one... but from the same tree. The seed pod I found at the bottom of the box was from a another time, maybe a decade and some change after the above picture was taken. My grandparents had decided to move back to Missouri permanently and were having the moving sale to end all moving sales. I was there to help out with the sale. Of course, I was an angry teenager full of teen angst and budding existential crisis, and I didn't want to be there. I wanted to hang out with my friends, not get rid of old junk. Sometime during the moving sale, I must have gotten in an argument with my parents. To avoid causing an even bigger scene and to cool off, I went for a walk. Whenever I get really angry, even to this day, the only thing that will really subside my rage and mellow my temper is an aimless and mindless walk. It does wonders! Anyway, I found myself under that same tree where I used to play. The cement block or "The Great Stone Table" was cracked, crumbling and shiny black from where oil had spilled. The man with the domesticated skunk (with the odor glands removed), the rehabilitated wildlife, and the peacocks that would nest in the slow-growth oak trees laden with Spanish moss had long ago died and all the wire cages were empty or long gone. I absentmindedly pocketed a few of the seed pods while I thought of the stories we used to tell, the games we played, the things we found... like the tire-swing over the ditch on the retired dentist's property. A little less mad, I stalked off to the marina to look for fossils in the limestone and gators on the bank. All the while, the seed pods were in my pocket. When I bent down to try and dig out a fossilized clamshell, out popped a seed pod from my pocket and I got the bright idea to "skip stones" with the seed pods. I was unsuccessful with a big "PLOP!" and the old lady who ran the marina came out and yelled at me about how I was "disturbing the wildlife." I ran all the way back to the house with one seed pod clenched in my sweaty fist. Finding the seed pod today brought back so many memories and made me realize just how much has changed and how in some strange way, I've come full circle. Instead of my grandparents having a moving sale, I'm about to have one. It'll be "my old junk" up for grabs. It's so odd thinking about the things we find, the fragments that when pieced together form a life. 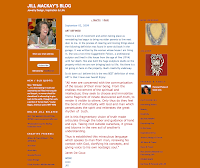 I keep coming back to a quote Jill MacKay posted on her blog by an artist named Janet De Coux who used to own the house Jill's living in now. The words have stuck in my mind and tumble around. I find myself thinking deeply on the "miraculous language". CLICK HERE to check it out. I was over at Kathy Van Kleeck's blog and read that she took a personality test. You can take it HERE. The funny thing is that I will randomly take these tests every couple of years and it seems like each time I take it, the result is different, but highly reflective of the state I'm in. Like the other Idealists, Champions are rather rare, say two or three percent of the population, but even more than the others they consider intense emotional experiences as being vital to a full life. Champions have a wide range and variety of emotions, and a great passion for novelty. They see life as an exciting drama, pregnant with possibilities for both good and evil, and they want to experience all the meaningful events and fascinating people in the world. The most outgoing of the Idealists, Champions often can't wait to tell others of their extraordinary experiences. Champions can be tireless in talking with others, like fountains that bubble and splash (or write) in the hope of revealing some truth about human experience, or of motivating others with their powerful convictions. Their strong drive to speak out on issues and events, along with their boundless enthusiasm and natural talent with language, makes them the most vivacious and inspiring of all the types. I am eyeball deep in sorting through, unpacking, and organizing in preparation for the BIG SALE! Who knew I had so much stuff? I just found a huge box of fabric-bound, blank, rice paper books. They're really great, but really... do I need 24 of them? I also found a (really cool) never-been-worn limited edition Kiki Smith Gap shirt, more vintage Avon bottles, and of course more beads and buttons! One of the more unusual finds were three sets of three vintage barrel-shaped mini-mug shot glasses (one set in green and two in brown). I ask myself why I have these... and a vague notion of a Wild West themed party comes to mind. Either that or the desire to make mini-A&W Root Beer Floats Charlie Brown style. I also found boxes tucked away that laid in wait like land mines. The contents of the boxes were filled with mementoes, old photographs, and sentimental trophies of yonder year. I am torn between chucking the old concert tickets and movie stubs, and shuffling through the shoeboxes and keeping them another year. I try to convince myself that I don't need these things anymore, but then I come across something that jars a memory half-forgotten and I am filled with reluctance at getting rid of a physical touchstone to my past. I guess all that I can promise is that I'll evaluate things case by case. Do you have some favorite beads that bring you joy? 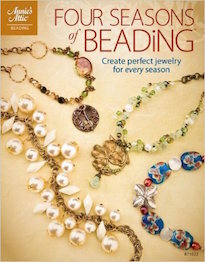 Lisa is using "inspirational sliders" to make gifts for friends and would love to hear about your joyful beads! What's in a name, the name of your jewelry pieces that is? 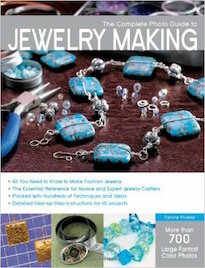 Here are a few tips to consider when naming jewelry you sell through the web. Wondering how big 20mm really is? Here's a handy size chart to keep by your computer. It'll help you out! Let's talk about tools! This time it's hole punching pliers and wire cutters. Carmi shows off her unexpected bead finds from a store in Little Portugal. Cindy brings some color to her new bronze floral medallions. Jean's got a cool job – check out what she's been working on! Cyndi shares another CopprClay project, which includes making your own mold! While in Philadelphia for BeadFest, Lorelei met up with Andrew Thornton and he gave her some presents! 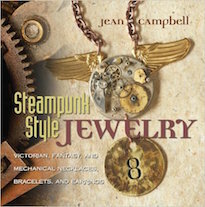 Jean reviews Contemporary Copper Jewelry by the wonderful Sharilyn Miller. Andrew and Diana Ptasynski of Vintage Blue Studio have a throw down! See how Andrew uses Heather Powers of Humble Beads' Polymer Bird-Head Pendant! The winner of the Andrew Thornton original necklace is Erin Prais-Hintz aka TesoriTrovati. Thanks goes to everyone who voted for my friend Cat and made her dream one step closer. You all ROCK! Thanks again! I've been meaning to post about this for awhile now, but have been out of commission. While in Philadelphia, I ran into Diana Ptaszynski of Vintage Blue Studio. It's always nice to see friends at the show! I remember when I first met Diana. I had a rather unfortunate experience of being almost knocked out, not once, but twice in the hot tub in the hotel room. I wanted to make something light, wearable, and played off the intense blues of the focal pendant. I used chalcedony, Peruvian opal, kyanite, fluorite, Swarovski Element Air Blue Opal bicones, and pieces from my family at Green Girl Studios. I quite like how it turned out! While I was away, my blog celebrated its three year anniversary. I am just about to hit 1,400 posts. In that time, much has been learned, lost, loved, and returned. For the past few days, I have been struggling with a nasty, persistent migraine that started on our way back from vacation. The only remedy has been cool, quiet, darkness – and in that darkness there has been time to think, dream, and ponder what the next three years will bring. I woke up one day, not too long ago, and realized that my heart was broken. How can you go so long without realizing that at the center, at the core, something is missing? The silly thing is that I didn't even realize it was gone. But while I was away, a gentle understanding washed over me as I stood, standing there doing the mundane task of washing dishes. The window was open and the evening songs of the crickets, the frogs, the night birds, the distant clicks and snaps of far off bugs filtered in and I realized that I missed the quiet that was not quiet at all. I missed the smell of freshly cut grass on the breeze. I missed the twinkling of stars and the light of fireflies. I missed these things so very much. That's when I connected all the dots and my days in the City became numbered. I don't know how or when it'll happen, but my chapter here in the City is coming to a close... for now. In an effort to streamline my life and make ready for the yet defined Move, I'll be clearing out a lot of my stuff. That includes my milk glass collection, my vintage Avon bottles, my bead stash, and my jewelry horde. The jewelry horde will include vintage pieces and some that I've made. So, it'll be a unique opportunity to get ahold of some of my work. For larger items, I'll be making posts on CraigsList and the like. The prospect of letting go is both exciting and frightening. It's my goal to lead a more genuine and in touch life. It's funny how stubborn I can be. It takes me days of blinding pain and darkness to affirm things I already know: Popularity means nothing. True friendship needs no words. Listen to your heart – it has all the remedies. Forget slights and insults and remember happy times. You are a force of change.